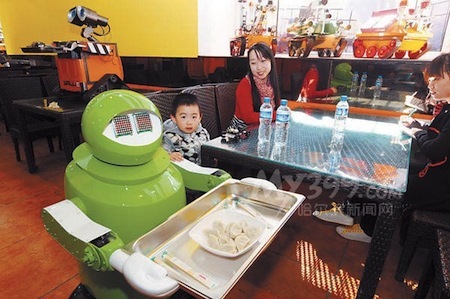 Robot employees outnumber human employees in this Harbin, China restaurant. 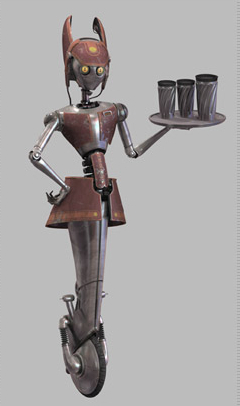 In all, the restaurant has eighteen robots, which do everything from cook food, welcome customers and serve food at tables. The owner says the robots, which cost between 200,000~300,000 yuan ($32,000~$48,000 USD), can display 10 different emotions and speak simple phrases. The robot stops automatically if a customer gets in its way thanks to ultrasonic range sensors, and will sound an alarm if it needs to be repaired. Each robot also knows how to return to an appropriate power source when feeling run-down, which happens about every five hours. SF moviegoers are happy with robot waiters; as I recall, R2D2 served as a robotic waiter on Jabba's sailbarge, and of course the waitress WA-7 from Star Wars II Attack of the Clones. From People's Daily via Plastic Pals.